The US may meddle in Myanmar's domestic affairs as it previously did in Iraq and Afghanistan if Naypyidaw doesn't hurry up and solve the burning Rohingya issue, Turkish politician Hasan Bitmez told Sputnik, warning that Washington's involvement risks exacerbating the situation even further. 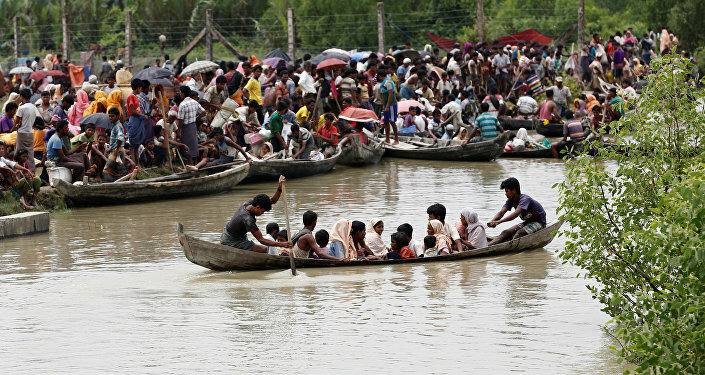 If the Burmese leadership fails to solve the Rohingya problem itself Myanmar may repeat the fate of Iraq and Afghanistan which were subject to US intervention in the early 2000s, Turkish politician Hasan Bitmez, the deputy chairman of the Felicity Party (Saadet Partisi) warned. "The main objective is to prevent the West from using its favorite strategy," Bitmez told Sputnik Turkey "In all the countries the Americans intervened in, it acted in ways which were not different from the bloodbath that the region faced prior to their invasion. We saw this in Iraq, Afghanistan and a number of other countries." According to Bitmez, those external forces that are seeking to accomplish their geopolitical objectives at the expense of Myanmar should be prevented from meddling in the country's affairs. He expressed confidence that the ethnic-religious conflict which erupted on August 25 in Myanmar's Rakhine State could be solved through peaceful means with the joint assistance of Muslim-dominated countries led by Turkey. The politician pointed out that the troubled region has long attracted the attention of global players since "it is located at the interface of the international energy and economic corridors." It makes Rakhine State "the point of intersection of Chinese, Indian and American interests," the Turkish politician highlighted. In 2004, massive energy reserves were discovered in the Rakhine region, prompting Beijing to jump at the opportunity to build a gas pipeline running from Myanmar's offshore field to China. Simultaneously, China constructed an oil pipeline, which connects Myanmar's port of Kyaukphyu with the Chinese city of Kunming in Yunnan province. The project allowed Beijing to diversify its energy transporting routes and deliver Middle Eastern and African oil bypassing the busy Malacca Straits. Additionally, Beijing views Kyaukphyu's deep-water port in Rakhine State as an essential part of its New Silk Road project. Back in 2014 a Kyaukphyu Special Economic Zone (SEZ) was officially established under the agreement signed by the Chinese and Burmese governments. In this context, the potential involvement of external geopolitical players, most notably, the United States, may put an obstacle in the way of Chinese economic initiatives and energy projects in the region. According to the Turkish politician, the last thing the external players are interested in is the fate of ordinary Rohingya Muslims. Bitmez suggested that Muslim states have to team up to solve the crisis through concrete steps including, possibly, the imposition of "economic and political sanctions." "If the government of Myanmar does not understand what dialogue and diplomacy are, it is necessary to seek another way out of this situation," the Turkish politician suggested, adding, however, that he believes that the crisis could be settled through diplomatic measures. Ankara had recently appealed to the United Nations as well as the Organization of Islamic Cooperation (OIC) to address the issue as soon as possible. Turkish President Recep Tayyip Erdogan also held phone conversations with the leaders of Malaysia, Indonesia, Thailand and Bangladesh through the Ministry of Foreign Affairs, while Foreign Minister Mevlut Cavusoglu discussed the Rohingya crisis with his counterparts from Indonesia, Malaysia, and Qatar, as Hurriyet Daily News reported last week. Citing President Erdogan's spokesman Ibrahim Kalin, the media outlet wrote Tuesday that Myanmar had provided permission for the access of personnel from the Turkish Coordination and Cooperation Agency (TIKA) as well as for the delivery of 1,000 tons of humanitarian aid to the Rohingya Muslim minority. 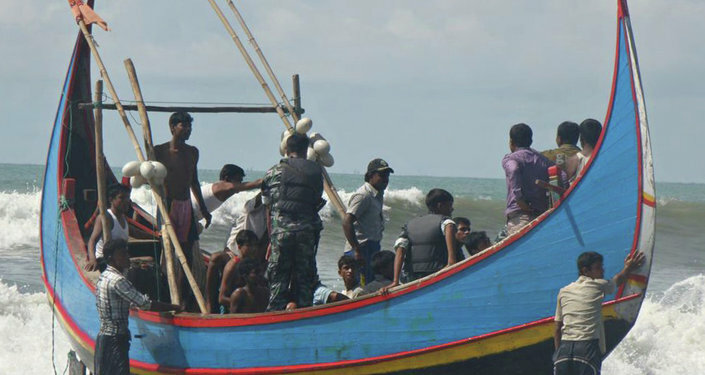 The Rohingya crisis started on August 25 when Muslim insurgents of Rohingya origin attacked security posts in Myanmar's Rakhine State. The tough response by the country's authorities triggered violent clashes, which have claimed the lives of at least 402 people. 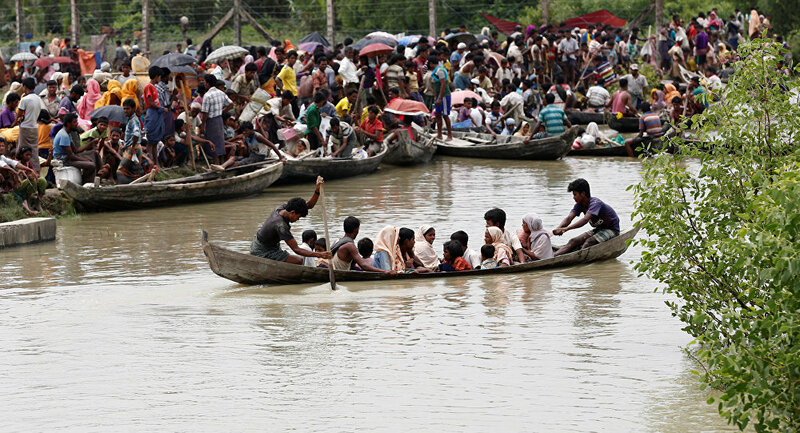 The conflict, which originally started about a century ago, has gradually escalated since 2011, hitting its peak in 2012 when thousands of Muslim families sought asylum in special refugee camps on the country's territory or fled to Bangladesh. Yet another escalation started in 2016.